It's suddenly all go around here, huh? Long time readers may remember this pattern from the first time around, but don't beat yourself up if you don't, 6 years is a long time! And it looks different now too, with it's fresh modelled shots. Indeed, Mushroom Cap was designed 6 years ago, and after only being out in the wilds for a few months, it was pulled (along with the couple of other crochet patterns I had) so I could devote time to them and bring them up to the same standard as my knitting patterns. 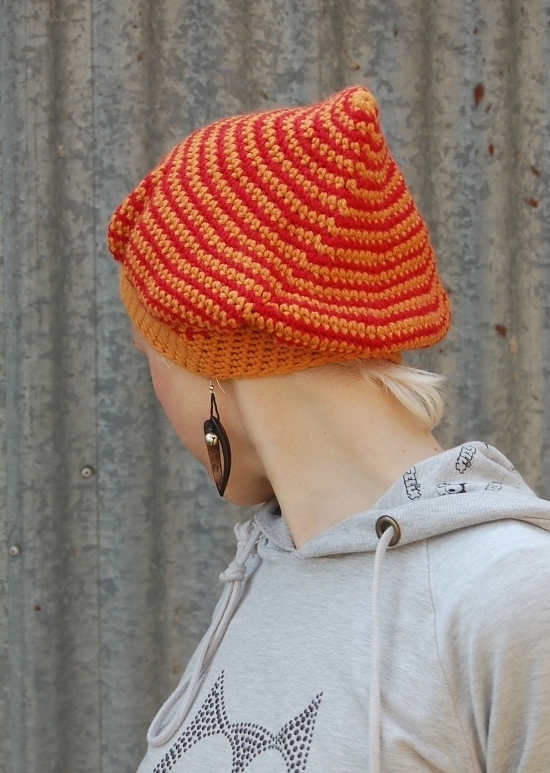 During that time, my knitting patterns have evolved and they've all been updated/reformatted etc more than once, which meant that the standard to which the Mushroom Cap had to reach just kept rising. And in turn, it just kept waiting and waiting... I never meant for it to wait that long but it was much easier to keep going with knitting patterns, being as my understanding of crochet pales by comparison. During that time my friend Clair of Flower Pot Tots helped me understand what my pattern needed, as she's much more proficient at crochet than most folks I know, but timing wasn't right, and it embarrassingly fell by the wayside again. Last summer, during one of my workshops at Fibre & Clay, I had the pleasure of meeting Valerie, who tech edits for Amanda at the Natural Dye Studio. We talked, and realised that Mushroom Cap may have another chance, and may just get to see the light of day again. The other crochet patterns were no concern, but this one has stuck with me because I like it so. And now, Mushroom Cap has been published, in all it's new spangly glory. I just love that shape, a beret-pixie hybrid! Sending the files off to Valerie was exciting enough but to see it published and ready again - amazing. This pattern sat at the bottom of my to-do list for years, and the feeling off ticking something off that's been there that long really can't be beat. Originally the pattern had only 2 sizes, and with Valerie's help, there are now 3. She's helped me with my pattern writing and notation (I have a tendency to write crochet patterns on knit pattern style...) and improved my overall approach to crochet patterns. The pattern also comes in 2 flavours - UK and US - so everyone is catered for. It doesn't include charts, that's a whole other minefield, but we both felt that for this pattern, written format was sufficient. I am thinking about maybe resurrecting some of my other old crochet patterns, if only to try them out and see how they work with all this new insight. 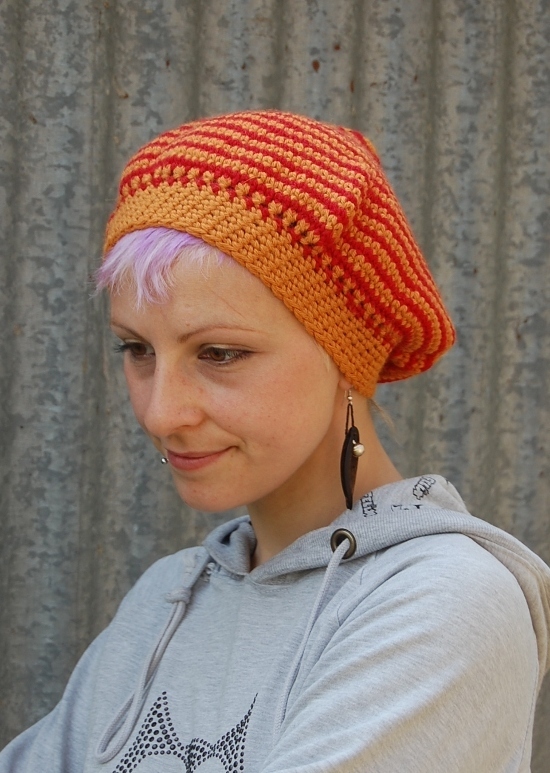 I'm also keen to start playing around with a hook again (not in a freeform sense, I'm totally ok with the less disciplined nature of freeform ;) to see if I can design some more Hats with patterns in mind. But no promises - my work load is heavy enough as it is. But I am v.tempted to play, and now I know there's a fantastic crochet tech editor that I get on with, then the incentive is greater.